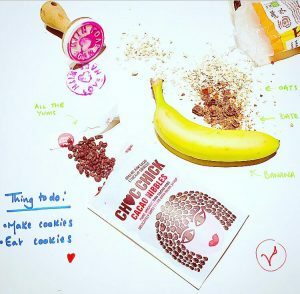 Here’s our favourite choc chip cookie recipe, great for whether your calorie counting, avoiding dairy or just in the mood to indulge! Made with pure, organic, raw Choc Chick cocoa nibs. Literally all the yums! Especially for me, a self confessed chocaholic. Perfect as an on the go snack to share with the kids (no sugar). And to top it off they’re gluten free, vegan and organic.